This Caramelized Onion Dip is an easy appetizer to make and serve along with the starters for your next party. You can also make this dip in advance and keep in the refrigerator for the times when hunger bouts strike. Pair it with Chips, Tacos or go healthy and eat it with the salad or serve it with crackers. Make this Caramelized onion dip recipe today, children love chip and dip combinations. To make a healthier version of this dip, use low fat yogurt and replace the cream cheese with 2 Tbsp of grated Cheddar. Dipping sauces are common condiment for many types of food. Dips are used to add flavor or texture to a food, such as pita bread, dumplings, crackers, cut-up raw vegetables, fruits, seafood, cubed pieces of meat and cheese, potato chips, tortilla chips, and falafel. Unlike other sauces, instead of applying the sauce to the food, the food is typically put, dipped, or added into the dipping sauce (hence the name). Dips are commonly used for finger foods, appetizers, and other easily held foods. 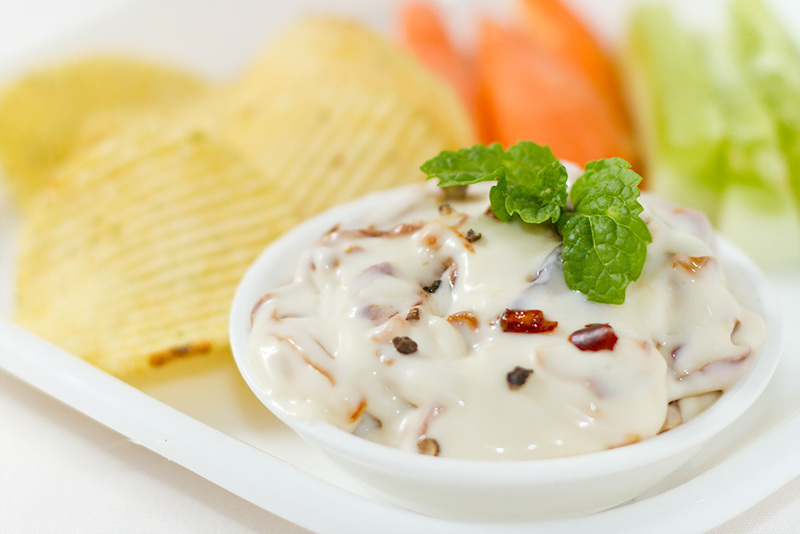 Thick dips based on sour cream, crème fraiche, milk, yogurt, mayonnaise, soft cheese, or beans are a staple of American hors d’oeuvres and are thinner than spreads which can be thinned to make dips. Alton Brown suggests that a dip is defined based on its ability to “maintain contact with its transport mechanism over three feet of white carpet”. Heat the pan (without oil) and heat sugar. Allow the sugar to melt and caramelize. Remember to keep an eye on this process -the liquid sugar should turn golden brown If the sugar burns and turns black, the dip will not taste good. Add oil to the pan with caramelized sugar and fry the sliced onions in it till they turn slightly crisp and golden brown. Remove and keep on a tissue to cool and drain the excess oil. In a bowl mix yoghurt, cream cheese, ground black pepper, chilli flakes and add the fried onions. Mix well with a spoon so that all the flavours blend. Garnish with fresh mint leaf and serve. Serve this delicious dip with or chips, tacos, salads, crackers or with any finger food of your choice. Lovely recipes thanks a lot.